July 08, 2009 Shawn Wildermuth No Comments. For my loyal readers of this blog, you've probably noticed the blog has had a lot of announcements lately and not a lot of content. That's on purpose. With the release of Silverlight 3 being scheduled for this Friday, I've been holding back on my Silverlight content until that happens. So check back this weekend for some, hopefully, interesting discussions! May 15, 2009 Shawn Wildermuth No Comments. April 08, 2009 Shawn Wildermuth No Comments. April 05, 2009 Shawn Wildermuth No Comments. April 03, 2009 Shawn Wildermuth No Comments. March 31, 2009 Shawn Wildermuth No Comments. March 14, 2009 Shawn Wildermuth No Comments. February 09, 2009 Shawn Wildermuth No Comments. January 21, 2009 Shawn Wildermuth No Comments. I will be coming to the Twin Cities Developers Guild to talk about everything Silverlight on February 10th, 2009. If you're in town and come by and watch me build a Silverlight application from scratch in 75 minutes. I will be showing off Blend and Visual Studio's mad XAML skills as well as how to retrieve data from the server. Its a fun talk! January 16, 2009 Shawn Wildermuth No Comments. November 24, 2008 Shawn Wildermuth No Comments. November 10, 2008 Shawn Wildermuth No Comments. I am coming to West Palm Beach, FL on November 25th, 2008 to do my Introducing Silverlight 2. If you are in the area, don't forget to stop by to ask me about anything Silverlight (or anything else for that matter). October 18, 2008 Shawn Wildermuth No Comments. October 10, 2008 Shawn Wildermuth No Comments. September 13, 2008 Shawn Wildermuth No Comments. July 22, 2008 Shawn Wildermuth No Comments. 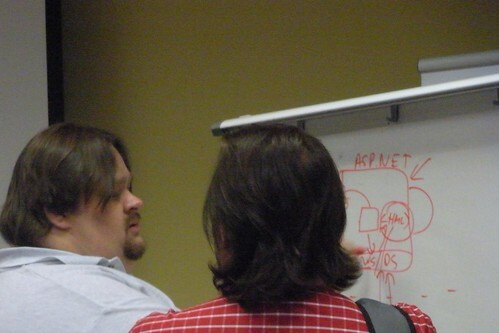 Next Monday night (July 28th, 2008), i'll be giving the short Q&A session at the Atlanta .NET Users Group. The topic? NHibernate's LINQ and ADO.NET Data Services support. If you're interested in using NHibernate but don't want to give up your LINQ skills, stop by for a listen! June 25, 2008 Shawn Wildermuth No Comments. In case you didn't catch it, I participated in a webcast called geekSpeak. This webcast was hosted by Glen Gordon and Chad Brooks. The topic today was "Silverlight and Line of Business Applications". While geekSpeak's usually focus on hands-on examples of creating code, we took a different tact today and discussed the larger topic of where Silverlight fits in the development ecosystem (at least Microsoft's ecosystem). June 22, 2008 Shawn Wildermuth No Comments. March 26, 2008 Shawn Wildermuth No Comments. March 12, 2008 Shawn Wildermuth No Comments. Its that time again. The Atlanta Code Camp is open for registration. I will certainly be doing a bunch of Silverlight 2 talks (though I am not sure how many yet). If you want a day of fun, learning new technologies and a way to meet the cream of the crop of the Atlanta speakers...register now!